Just because you turn 50 doesn’t mean your dating life stops. If you’re single and looking for love, the thought of going to a bar or club to find it may put you off. The Internet, however, has made the senior dating option much more viable. In fact, numerous studies have found that more and more senior citizens over the age of 50 have turned to online dating to find love. Of course, you may have some reservations. However, with some helpful tips, you don’t have to be hesitant about this clearly viable option. Before you sign up on any kind of Internet dating site, be sure you do your research to find one that you really like. Would you like to pay for your chance to meet someone? Or, would you rather go with the free option? 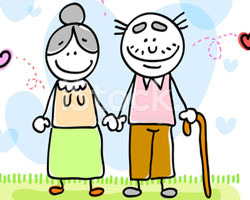 There are also general dating sites as well as niche dating sites for seniors only. Check them out and decide which one is right for you. If you find this process to be time-cost and annoying, referring to a dating review site would be a great solution for this issue. When it comes to your profile, read over others’ profiles to see what they’ve written. Most folks will mention they like walking on the beach for long periods of time or enjoy traveling to new places. It is ok if you really like to do so. But instead, you can also write a profile that expresses your lifestyle choices and values to make you stand out. No matter what your writing style is, remember that be real is the key. Your friends can give you some helpful advice on what picture to choose for your profile and what you should say about yourself. Friends can be objective whereas you can’t. Listen to your friend, as what you say and the picture you choose can entice or deter people from getting in contact with you. If you do find a person you’re interested in talking to or, better yet, someone contacts you, it’s best to be cautious. Instead of talking to them on your home phone, have a cell phone. If you decide to finally meet, do so in a public location – library, coffee shop, etc. You want to be sure you’re meeting who you’ve been talking to. Dating is difficult to do, no matter what age you are. If you’re a mature single over the age of 50, you may find the Internet intimidating in the dating process. Don’t! The only difference is you’re meeting a potential mate online and not in person. You still need to be cautious and take your time.